Coraline Jones (Dakota Fanning) moves with her mother (Teri Hatcher) and father (John Hodgman) from her comfortable life in Pontiac, Michigan to the Pink Palace, a dilapidated three-apartment building in Ashland, Oregon, which is also occupied by retired actresses Misses Spink (Jennifer Saunders) and Forcible (Dawn French), and eccentric Russian acrobat Mr. Bobinsky (Ian McShane). With her parents perpetually working on a gardening catalogue and paying little attention to her, Coraline feels neglected and decides to explore their new home, befriending Wybie Lovat (Robert Bailey, Jr.), the grandson of the apartments' landlady. While exploring, Coraline finds a small door sealed off by a brick wall. That night, Coraline is awakened by a mouse and follows it to the small door where she discovers that the brick wall has been replaced with a long, dark corridor. Coraline goes through it and finds herself in the Other World, a fantastical parallel version of the Pink Palace inhabited by doppelgangers of her parents called the Other Mother and Other Father, who have black buttons for eyes. These beings prove to be warmer and more attentive than Coraline's real parents, particularly the Other Mother, who does everything she can to impress Coraline. Coraline decides to stay the night at the Other World, but when she awakes the next morning, she finds herself in her old world. Despite warnings of danger from her neighbors, Coraline continues to go to the Other World at night to escape from the doldrums of her real life and is entertained by button-eyed "Other" versions of her neighbors, including a mute Other Wybie, who guides her through the Other World. During her third visit, Coraline encounters a black cat (Keith David) from her own world which has the ability to talk in the Other World, and also warns Coraline of danger. Coraline disregards the warnings until the Other Mother offers her to live in the Other World forever if she sews buttons over her eyes, and demands to return home. Angered, the Other Mother reveals her true form as a monstrous witch and traps Coraline in a small room behind a mirror where she meets the ghosts of three children who had lost their eyes and souls to the Other Mother. 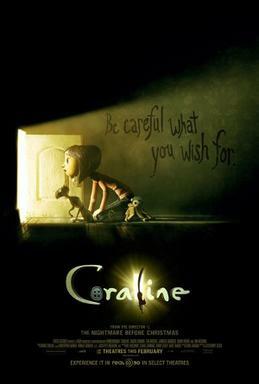 With the help of the Other Wybie, Coraline escapes to her own world, but finds that her parents have been kidnapped by the Other Mother. Armed with a seeing stone provided by the real Spink and Forcible, and accompanied by the black cat, Coraline returns to the Other World to save the ghost children and her parents. Coraline challenges the Other Mother to a game to find her missing parents and the eyes of the ghost children in the Other World, or else have buttons for eyes and stay in the Other World forever if she loses. Coraline uses her seeing stone to find the ghosts' eyes and outwits the twisted inhabitants of the Other World guarding them. One of the ghost children tells Coraline that the Other Mother will never let her leave even if she wins, Coraline tricks the Other Mother into opening the door to the real world and she then finds her parents trapped in a snow globe Coraline then throws the cat at the Other Mother and he scratches her buttons out. Angered The Other Mother transforms the house into a spider web to capture Coraline, but Coraline escapes and,with the help of the ghost children closes the door on her hand, severing it. Coraline finds her parents safe with no memory of what had happened, and the ghost children at peace. To keep the Other Mother from returning, Coraline goes to drop the key to the door between her world and the Other World down a water well near her house. The Other Mother's severed hand enters Coraline's world and tries to drag Coraline back to the Other World, but Wybie arrives and destroys the hand, and he and Coraline drop its remains and the key down the well. With her parents done with their work and able to spend time with their daughter, Coraline holds a garden party with her family and neighbors, content with her new life. The black cat, meanwhile, stood by the garden gate, walks behind a signpost, failing to reappear on the other side.